Iridium NEXT satellite. Photo: Iridium. New Iridium Certus aircraft terminals being developed by Collins Aerospace will bring speedier satellite-based connectivity to in-production Boeing 737 MAX and future 777X cockpits. First unveiled in 2016, Certus is Iridium's multi-service communications platform designed to provide safety services communications, with two voice channels and aircraft communications and reporting system network data link connectivity simultaneously. Value-added manufacturers (VAMs) of the Certus terminals–such as Collins Aerospace and Thales, among others–are also developing lower cost versions of Certus platforms for general aviation aircraft. 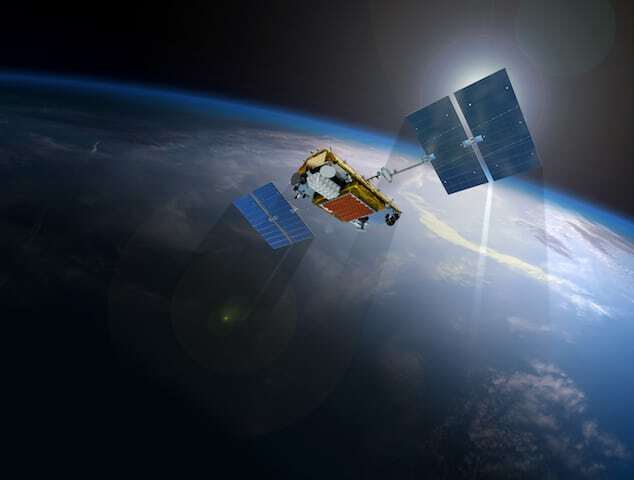 The service is also being used by Iridium to provide data and voice communications to other industries in two different configurations, including a lower speed 352 kbps connection and a higher speed 704 kbps version. Progressively, terminal speeds will eventually reach 1.4 mbps, using software featured on the new Iridium Next satellites. Terminals being developed by Collins will be the first forward-fit Certus terminals certified for Boeing's in-production 737 MAX, and the 777X, which is projected to begin commercial passenger service next year with launch customer Qatar Airways. Mike Hooper, director and general manager of Iridium's aviation business, told Avionics International the initial 350 kbps connection can be upgraded to 704 Kbps with a firmware update. Hooper said Future Air Navigation Systems (FANS) and air traffic safety services are also available for pilots through Certus. "Certus is bringing a new level of high-quality voice capabilities and is expanding to a wide range of Electronic Flight Bag products and full range of sensor/data readings from the aircraft. These services can then help simplify adoption of things like flight data recorder streaming and other vital aircraft communications. Overall, the Iridium Certus service will expand what's possible on the flight deck and in many respects is only limited by what our dozens of technology partners imagine as applications of the future," Hooper said. While pilots are still unable to use Certus or other satellite communications channels as a primary means of safety services communications with air traffic controllers in place of an HF radio, civil aviation regulators are developing satellite-based voice (satvoice) regulations to enable this. Current ICAO and regional civil aviation regulations require two long-distance radios for all trans-oceanic flights; historically, that has always meant high-frequency (HF) radios. However, the FAA is among several civil aviation regulators developing requirements that could eventually allow operators to use satvoice technology, such as what Certus provides, as a primary means of communications with controllers. Collins Aerospace is one of five VAMs with exclusive rights to develop aircraft terminals for the Certus service, and the only one of those five that is also a value added re-seller of Iridium satellite bandwidth. On the 737 MAX, the company currently provides the aircraft's line-fit legacy NextLink Iridium terminal that it acquired as part of their acquisition of ICG in 2015. Another VAM, Thales, is currently targeting FAA certification later this year for its Flytlink Certus terminal. Thales also intends to produce additional versions of the Flytlink avionics featuring stand-alone Iridium Certus versions of the system, according to Hooper. The French avionics manufacturer has not said what terminals Flytlink will be available for yet. Steve Timm, vice president and general manager of commercial avionics for Collins Aerospace, said the Collins terminal gives 737 MAX and 777X pilots access to tablet-based graphics and data-rich aircraft applications that require higher data speeds. "It provides three channels that are configurable, typically dual voice with single channel dedicated datalink. The lift that Certus provides is bandwidth, specifically to get to an [internet protocol suite] IPS standard and beyond," Timm said, referring to the next generation IPS network infrastructure being developed to support the use of Commercial-Off-The-Shelf (COTS) products to support air to ground aeronautical safety services communications. Collins expects certification of the Certus satcom terminal in 2021.